In the summer of 2008, I had the privilege of sitting in on a talk given by a high performance coach - someone with many years of experience teaching others how to work as effectively and as efficiently as possible. The one key point that I took away from his talk was to create clean focus time each day. Clean focus time is time that you spend devoting every aspect of your being to the most important task on your plate. Clean focus time requires that you close the door to your room, turn off the ringer on the phone, disconnect your internet access - or at least any programs that can alert you to new notifications and e-mails - clear your desk, and devote your physical, mental, and emotional energy on one thing. Learning about clean focus time was a huge wake-up call for me. Prior to learning about it, I considered myself to be a good multi-tasker, able to complete several tasks quickly and efficiently, all at the same time. The reality is that we can never truly multi-task. Even while multi-tasking, we do bits of one thing at a time, and as we scurry from task to task, we interrupt our focus on each task at hand, which typically results in being inefficient. I've learned from experience that a far better way to produce quality work in the most efficient manner possible is to spend at least a solid thirty to sixty minutes at a time on each task. The key is to work on nothing but one task during those thirty to sixty minutes. I've actually found that quite often, I get so locked in on clean focus time that I end up working for up to two hours straight on one project. Once I really started getting into clean focus time, to best support my clean focus sessions, I began using audio technology called brainwave entrainment to ensure that my natural brainwaves are locked in at a frequency that is best for promoting optimal mental focus, alertness, and concentration, all while being pleasantly relaxed. You listen to an audio track that's been programmed with quiet pulses that are spaced at just the right frequency to promote the brainwaves that you need for a specific task. In the case of clean focus time, the frequency range right around 14 Hertz. To make the pulses pleasant to listen to, they're blended with soothing sounds of nature. I worked with a professional audio editor to experiment with a number of sounds, and the three that we liked best were a steady rainfall, a quiet creek, and a gentle waterfall. So these days, I almost always listen to one or more of these tracks during my clean focus times, and I'm still amazed by how much more I'm able to get done in clean, efficient chunks of time. I wish that I knew about clean focus time and had access to this type of audio technology when I was in school, as I know that all of this would have saved me from the many all-nighters that I pulled throughout my undergraduate and graduate years. I'll definitely be encouraging our two sons to apply clean focus time and this audio technology to their studies when the time comes. 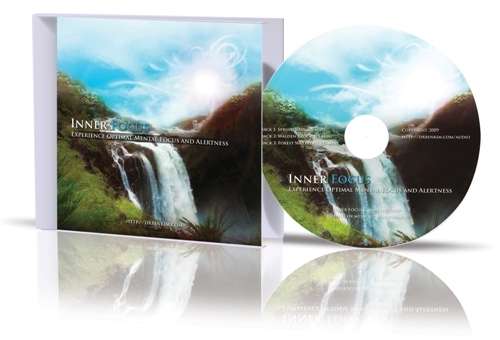 The three tracks that my professional audio editing partner and I created are available as three separate, 25-minute tracks on a single CD called Inner Focus. 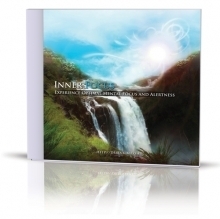 Inner Focus is now available at our natural health shop. And because there are no gray areas that can significantly affect it ability to produce results, I invite you to give it a try for up to a full year. Use it whenever you need to experience heightened mental focus and concentration. If you don't find that it helps you in a significant way, send me an e-mail at feedback (at) drbenkim.com and I'll be sure that you're given a refund. I'm that confident that this technology can help others just as it's helped me. Just one final note: though brainwave entrainment doesn't technically require that you use headphones for optimal results, in using all three tracks on Inner Focus with and without headphones numerous times, I've found that I get my best results when I use headphones. There's just something special and meditative about listening to a steady rainfall, waterfall, or a quiet creek as though I'm sitting right in the middle of a peaceful forest. 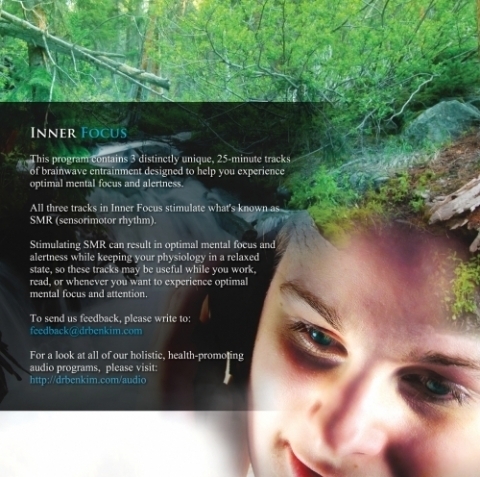 Please note that you can ask for a refund up to a full year after giving Inner Focus a try; a refund constitutes 24.95 USD minus S&H to your location.